I read the book Effective C++ by Scott Meyers a while ago when I started the development of the engine. I learned a great deal from this book. Like everything in life, if you don't practice what you learn, you will forget it. So I decide it to read the Effective C++ book again and share what I have learned. 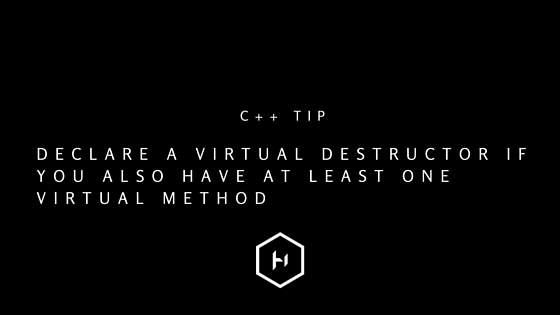 Tip: Always declare a virtual destructor if and only if you also have at least one virtual method. If you have virtual functions in a base class, make sure to declare the base's destructor virtual. For example, listing 1 shows a base class with a virtual method and a non-virtual destructor. Now let's say that you have a derived Animal class called Monkey with a modified run method. What would happen the moment that you delete the Monkey instance? Results are undefined when you delete a derived-class object with a non-virtual base destructor. What usually happens is that the derived class object is never destroyed. This is a great way to have memory leaks. A simple fix to this is to make the destructor in the base class virtual as shown in listing 2. How about when you are dealing with Abstract Classes? If you recall, Abstract classes contain Pure virtual methods. Moreover, abstract classes can't be instantiated. When dealing with abstract-classes, declare the destructor as a pure virtual method as well. This is shown in listing 3. Remember, pure virtual-destructor in an abstract class must provide a definition. This is shown in listing 4. So, if you have a polymorphic base class make sure to declare its destructor virtual. I want to be a game engine developer. Do I need to learn assembly programming?